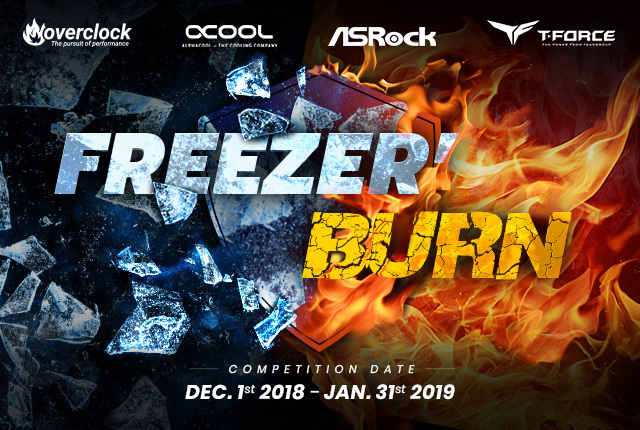 During the months of December of 2018 and January of 2019, Overclock.net hosted a large scale computer overclocking competition. This was the second competition of its kind to be hosted at OCN. It was a different type of competition because the goal was to create one universal platform that would entice as many people as possible. With the Freezer’ Burn competition we attempted to arrange it so that all cooling categories were rolled into one cohesive event. Effectively, we split the competition into two separate parts but both parts used the same hardware and benchmarks selections. For those who have normal air or water cooling there was the ambient class. Then for those who wish to use more exotic cooling methods such as LN2 or Dry Ice, there was an extreme class. 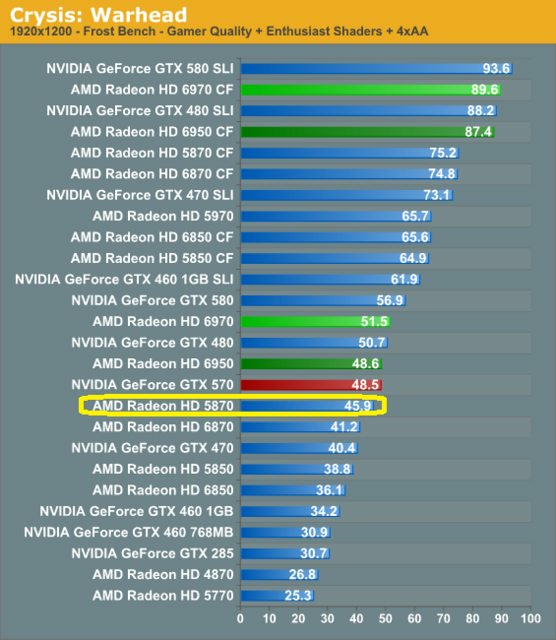 In order to appeal to the widest audience possible, we decided to focus on both 2D and 3D benchmarks. There were a total of four benchmarks, but only three counted towards the users total points. 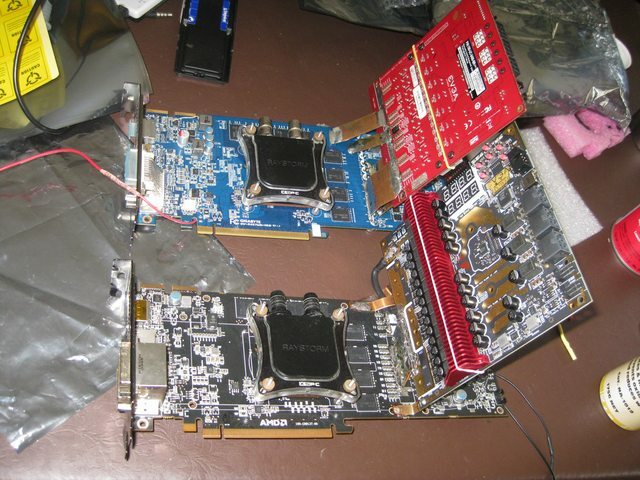 We decided to use the ATI HD5000 series graphics cards because they are widely available and inexpensive. It soon became apparent that most serious competitors chose to use the best card in the series, the HD5870. 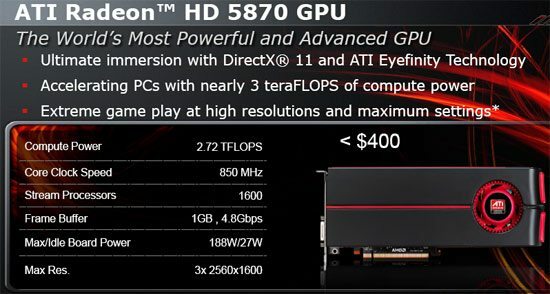 The now infamous HD5870 was released in September 23, 2009, and it is the fastest (single gpu) card of the generation. Most overclockers know that in order to get the maximum overclocking performance out of any graphics card, the voltage needs to be increased. The HD5800 series did not disappoint in that regard. We learned that it responds well to a small voltage increase and it can still be used for ambient cooling. Throughout the course of this competition we saw quite a lot of graphics card hard modding going on. One user comes to mind is macsbeach98. He chose to do not only one, but two extreme mods to his cards. He did a complete VRM replacement voltmod which replaces with existing voltage control hardware and utilizes a higher power voltage regulation module for increased potential. I must admit, being a modder and fan of external VRM modding myself, I recognize that he did an incredibly good job with the soldering and overall construction of his mods. The concept of having two split cooling classes was a success. Those users who wanted to use ambient cooling were not overshadowed by the users with extreme cooling. While both cooling classes had lots of activity, we certainly saw the most submissions in the ambient cooling category. In the ambient category, we saw everything from completely stock OEM cooling solutions, AIO water cooling, custom water cooling, and even some ice water cooling. 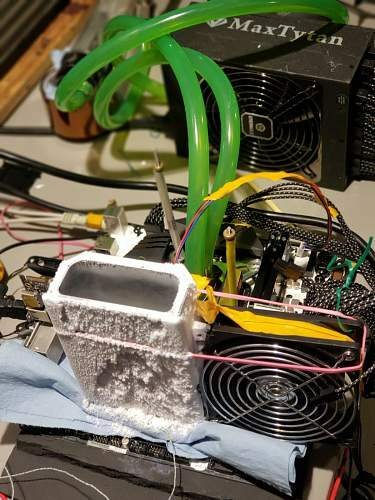 There were a few users, mostly in warm ambient climates, who tossed in a few ice cubes into their water cooling reservoir. This was legal since they stayed within the temperature limits.. On the other end of things, In the extreme category, we observed everything from chilled water loop, dry ice, and the obligatory liquid nitrogen. There was no shortage of interesting cooling methods being used on the ambient side of things. 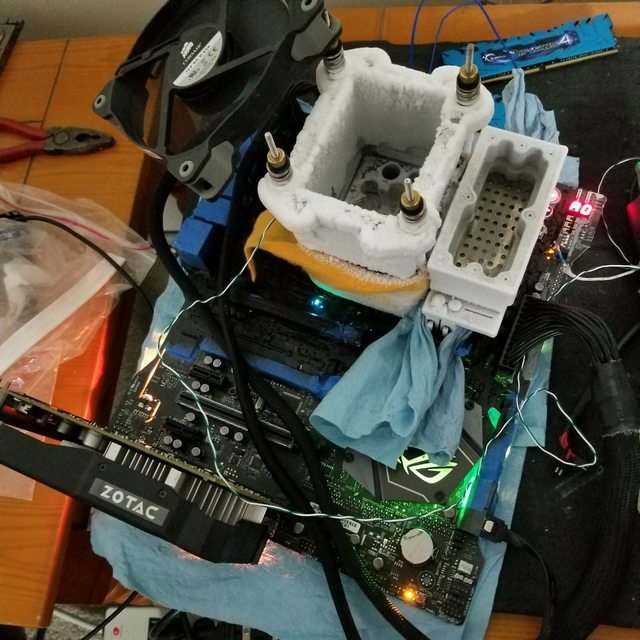 Here we can see the user kicsipapucs using what appears to be a CPU cooler on his graphics card. Check out the little support pedestal he made using leggo’s. The balance of 2D and 3D was fairly even, however we did see the most activity in 2D for both extreme and ambient categories. Right from the start we saw a battle going on for the top Cinebench R15 in the ambient category. It took some submissions to see the trend that developed, but we soon found out that Intel 4-core CPU’s were best when dividing Cinebench R15 results by core count. The OCN Hwbot member bigblock990 got first place in all four of the ambient stages. He used a combination of an i7 7700k and i9 9700k with both ASRock and Asus motherboards and several different HD5870’s to get the job done. 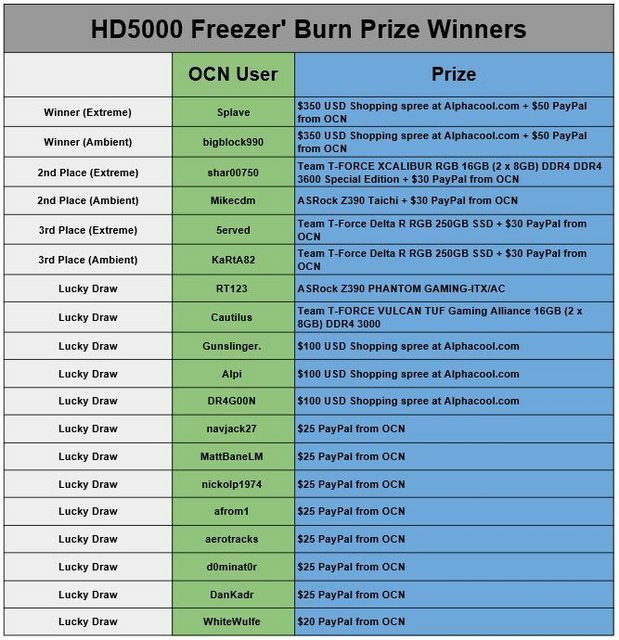 The user Mikecdm came out of retirement and managed to get second place even after just learning modern DDR4 overclocking for this competition. Third place goes to KaRtA82, he is a well known hwbot bencher and community member. The ambient category was highly contested just about daily and it was very entertaining to watch. Things on the extreme side were a bit quiet at first but picked up nicely about halfway through. The process of taking computer equipment subzero is far more time consuming and requires more planning. First place goes OCN’s very own Hwbot points leader, Splave. He is currently the number one ranked overclocker in the world!. 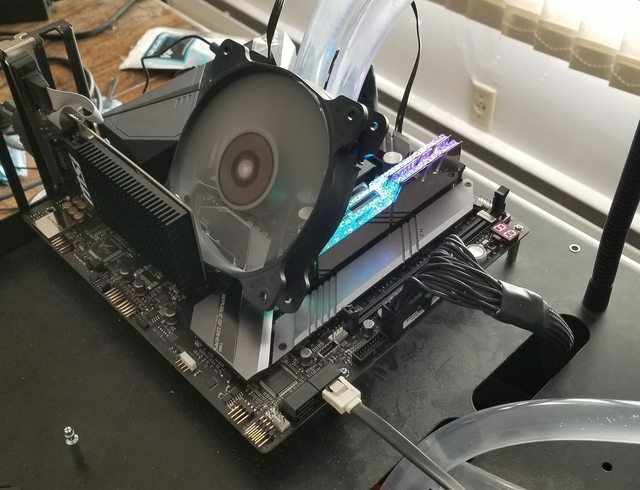 He managed to clock his HD5870 up to staggering speeds with very basic mods only, and currently holds the world record for Vantage and others. Splave took first in all three stages that he submitted results for. Second place goes to mllrkllr88 (myself). I used an HD5850 and managed to achieve the highest Vantage clocks on hwbot by using an external VRM on my card. Third place goes to shar00750. 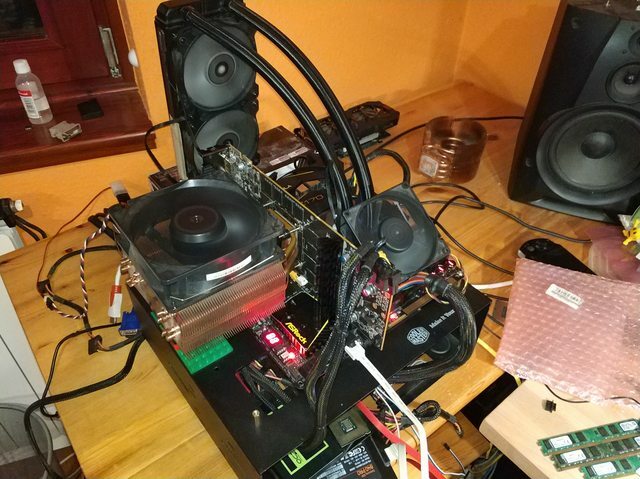 He used a combination of HD5870 and HD5850 graphics cards for his placement. It would not be ethical for me to win prizes in the competition, so shar00750 will take the second place prize. Similarly, the 4th place ranked competitor will take third place prizes. There was a tie between 5erved and rt123 for the third place ranking. Because 5erved has a better GPUPI score, that user will take the official third place ranking. Any good competition wouldn’t get very far without having awesome prizes. In this competition we were fortunate to have incredible backing from our sponsors. The main sponsor for the event was Alphacool. Together with ASRock, Team Group, and Overclock.net, they sponsored the even with 6 prizes totaling over $1500 USD. 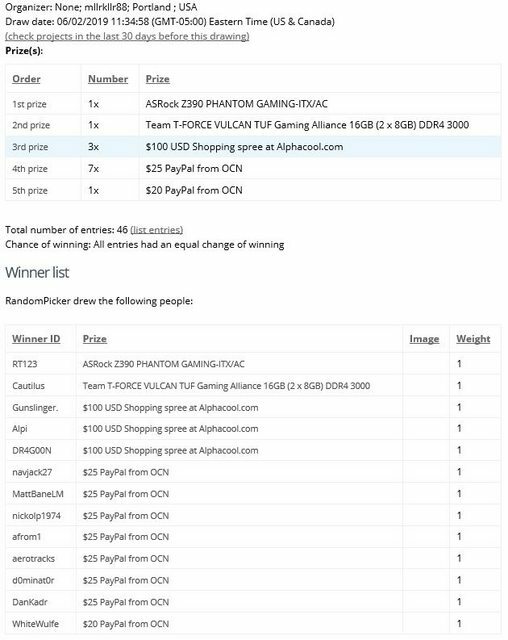 To make the prize pool even more amazing, all four sponsors stepped up and offered 13 prizes totaling over $800 USD to be used as lucky draw for all participants. Please take a minute and thank the sponsors by simply going to their website. This seems like a small and meaningless thing, but it makes a big difference. One unique and special aspect of this competition is that we are offering 13 lucky draw prizes. The top three finishers of each category (6 total) won a set price, but everyone else who participated (except those who entered as prize exempt) was entered into a drawing for the lucky draw prizes. The competition ended with 54 total participants. Of the participants, 6 were the winners and 3 were prize exempt. With 13 lucky draw prizes and 45 eligible, the odds are quite good. In summary, 45 eligible participants and 19 total prizes means that roughly 36% of everyone involved won a prize!!! If you won any of the prizes outlined above expect a PM from me in the next few days. Please be patient with the prize disbursement timeline, as this process can take many weeks to collect all the information and coordinate with the prize sponsors. Given the outcome of this event, I believe we can offer more events like this in the future. 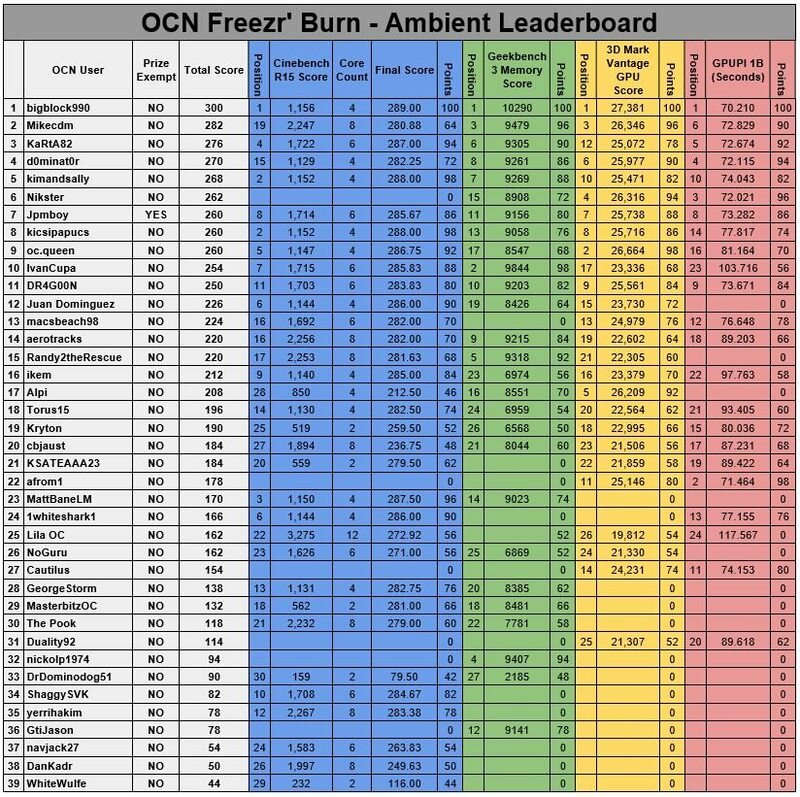 I think the Freezer’ Burn platform (aka subzero or ambient), is a good basic structure for future competitions. This would be an excellent time to give us some feedback. What did you like? What didn't you like? How would you change it in the future? Last edited by mllrkllr88; 02-11-2019 at 08:52 AM. Amazing job and great comp! Wahoo! Again thanks to all the people that are able to bring this kind of stuff to OCN. And a big thanks to the sponsors. Had fun this second time around, and cannot wait until the next one. Thanks to the sponsors, and everyone who participated! Thank you for such great event , planning and execution was flawless. It also brought me out of retirement after ~5 years without touching LN2 . Thank you for everyone involved on the making of this event and i'm looking forward to the next one. Congratz to all the winners and participants. Had a blast and lots of fun ! Thanks to everyone who helped put this together. I am sure it's a lot of work. Thanks to the sponsors as well. Congrats to everyone what won a prize!!! Without the hardware sponsors, these awesome prizes wouldn't be available. Let's not forget to give them a round of applause as well!! I can't wait to see what OCN cooks up for the next forum comp!! The comp was well organised and tons of fun, big thanks to Mllrkllr and everyone else who made this possible. I definitely liked the ambient and extreme split ladders and the large lucky draw prize pool that means everyone had a decent chance of winning something, even if they didn't get the best results. Also counting your top 3 subs towards the final score also helps if you are lagging a bit in one particular bench, in this case maybe if you had **** memory but still a good CPU you'd still be competitive. So that was also a great feature imo. Last edited by Cautilus; 02-06-2019 at 06:23 PM.